When choosing a colored diamond, there’s much to consider from the color itself to whether it’s been treated or natural. There’s also supply and demand to consider. When it comes to pink diamonds, they’re considered one of the rarer diamonds and highly sought-after especially since they are used in engagement rings. This makes them an emotional purchase. Celebrities like Jennifer Lopez and Blake Lively have received pink engagement rings, which makes the pink diamond even more popular. Pink diamonds are also used in other settings like earrings and necklaces, too, but they don’t have the same impact as a pink diamond engagement ring. In white or colorless diamonds, the GIA or Gemological Institute of America, grades based on the carat, cut, clarity and color of the diamond. In the case of colored diamonds, they base the prices on the depth of color. 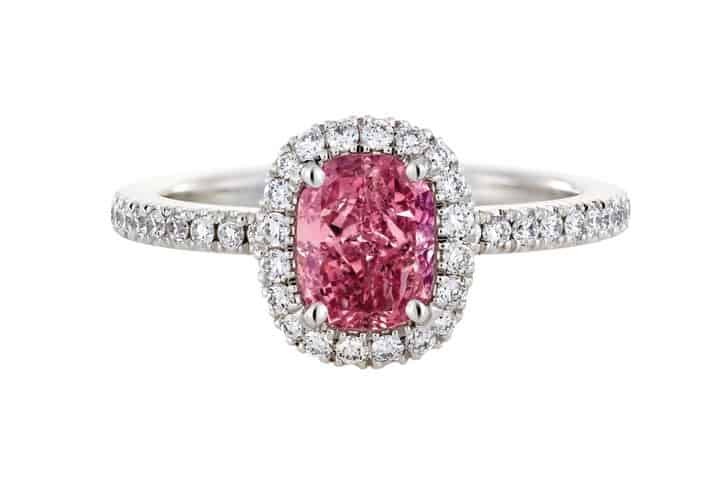 A fancy pink diamond will cost less than a vivid pink one. While there’s no formula to how much more it would cost, the intensity of the color is the largest factor in determining value of colored diamonds. 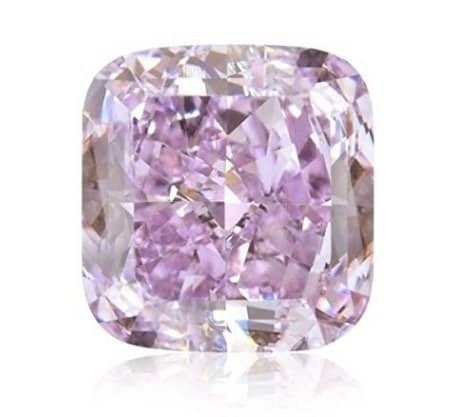 …is approximately the same price as this purplish-pink 0.43 carat Fancy Intense pink diamond, which is available on Amazon. 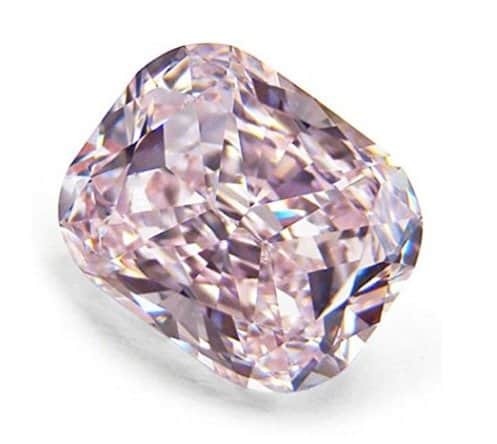 The pure pink of the first diamond raises the price considerably. The color grading system represents the depth of color and saturation in the diamond. 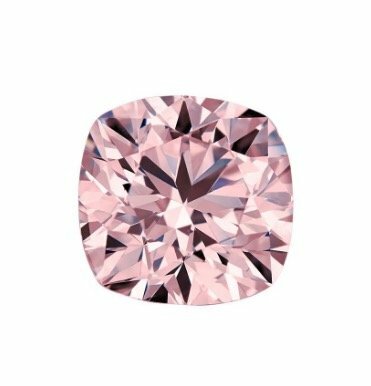 Faint pink diamonds will have a very light pink tint to them while on the other end of the spectrum, Fancy Vivid pink diamonds will be a deep, saturated pink. It provides a scale for pricing as well as for the customer to pick the saturation of color they want. While the intensity of the diamond’s color makes up 90% of the price, the weight and cut of the colored diamond have an impact as well. If you have a 1 carat pink diamond and two .5 carat diamonds, the 1 carat will cost more since the bulk weighs more. When it comes to the cut, colored diamonds are cut to enhance the color, not the clarity like white diamonds. Another factor in the price, and one of the biggest factors, is the secondary colors of the diamond. 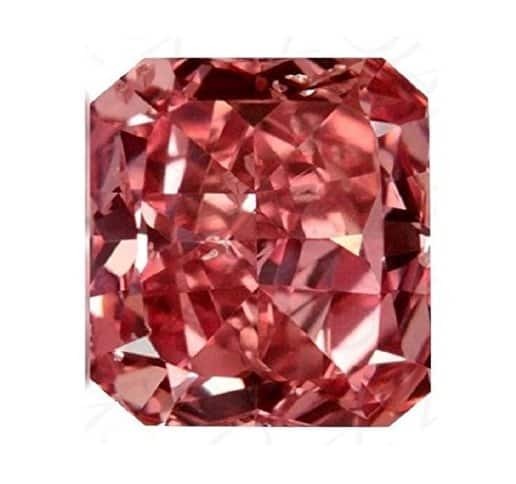 In the case of pink diamonds, a pinkish-brown one will cost more than a regular brown diamond. A brownish-pink diamond will cost more than a pinkish-brown one, too. The first color listed is the secondary color, or the tint of the diamond. A brownish pink diamond is a pink diamond with a brown tint. The secondary color listed is the dominant color, and it’s the one that has the most impact on the price. When pink diamonds were being formed in the Earth, they were subjected to intense heat, which caused them to absorb green light rays. This gives them their reflective, pink hue. Treated diamonds are ones that are subjected to HPHT or High Pressure High Temperature or Irradiation. Usually, these treatments are done to brown diamonds, which are the most inexpensive of the diamond colors. After being treated, the diamonds will end up a different color. It’s important that the diamond purchased has a GIA certificate to authenticate the stone creation and stone treatment method if any. A natural stone that has been treated will list the treatment method on the report. For example, one that has been irradiated will list that on the report. It’ll have the carat weight, color grade, color distribution and color origin, too. If you’re trying to save money on a pink diamond, you can use the above knowledge to your advantage. Pink diamonds with a hue of orange or purple can be as stunningly beautiful as a pure pink diamond. A faint pink diamond will be less expensive than a fancy vivid pink, but can be enhanced with its setting. A Fancy Intense purple pink diamond can have its color enhanced with a rose gold setting. You could also buy a smaller carat diamond and surround it with a circle of small pink or white diamonds to create a more impactful piece of jewelry. Each pink diamond is unique. 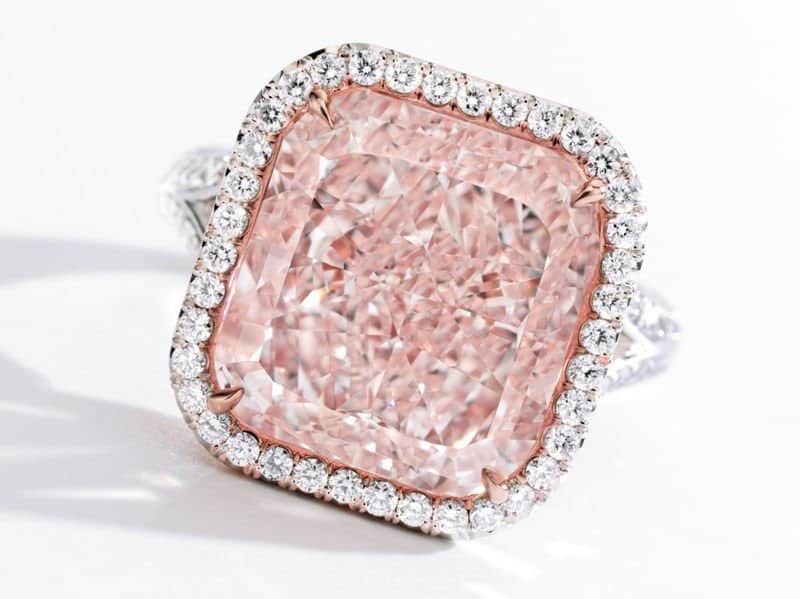 The color’s intensity, cut, carat, and hue will have an impact on the price of the pink diamond. You’ll have to decide whether you want a small, Intense pink diamond or a larger Faint pink diamond. Each will be a romantic and beautiful piece of jewelry. The choices will be based on your budget considerations and the occasion for the purchase. There’s no right answer or formula that can be applied to the purchase of a pink diamond. The cost varies between seller as well as the other factors mentioned.